Wednesday afternoon Annabella Azín Noboa, together with Juan Crespo, Joselyn Jaramillo, Franklin Rivadeneira, Martha Illescas and Juan Carlos Creamer, candidates for legislators, representing the Province of Azuay for the Adelante Ecuatoriano Adelante party, visited the city of Cuenca to dialogue with its inhabitants and listened to their needs and what their requests. Among the list of petitions of the Cuenca citizens are the transparency of the Executive and Legislative power, the elimination of corruption, more sources of employment, the eradication of drug trafficking, more drastic laws that reinforce security and combat crime, free education, extension of university quotas for students and that they can choose the profession of their preference, lower taxes and the reform of the land law. “Our parents worked hard to give away their lands to others. That cannot be possible! Never! We have suffered, we have starved to death if possible, to have something,” said Targelia, a flower vendor. At nightfall, the leader of the party Alvaro Noboa, accompanied by Guayas District 1 candidates, under a heavy rainfall, visited the Guangala sector, in Guayaquil, where its inhabitants issued similar requests. “That’s why Ecuadorians because we’re going to win! Vote for us! Go forward Ecuadorians, go forward!” said Alvaro Noboa. 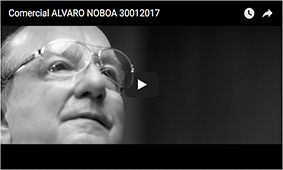 It is expected that Alvaro Noboa visits Manta on February 2nd. The meeting point will be the Cathedral, where he will meet with Aracelly Bravo, candidate for Legislator, representing the Province of Manabí, and other members of the group. Meanwhile, Annabella Azin will accompany Sofía Caiche to tour La Florida sector, in Guayaquil. Both concentrations will start at 17:00.